Fuel economy is something that should be payed attention to, and how fuel efficient your car is. While purchasing a car, the petrol/ diesel prices might be low but that doesn’t it mean it will always stay like that. Fuel prices increase and decrease over time, sadly they increase more than they decrease. Anyways, when we look at this fact, we should try our best and find the most fuel efficient car in our range. Here are some cars that are fuel efficient. Some tests prove that the Prius returned 52 mpg overall, a significant improvement over the previous generation’s 44 mpg. Not only that, the new car also handles more responsively and rides more comfortably. Colorful digital gauges dominate the dashboard with abundant fuel-economy information. The touch-screen infotainment system is fairly straightforward. This quite great car has always been about efficiency and low running costs. Driving solely is something else this car can do as well, about up to about 25 mph typically, and the engine is now quieter when it kicks in. However, the seats are rather chintzy, tire noise is noticeable, and cabin access is not as easy because of the car’s lower stance. A plug-in version, the Prius Prime, can go about 23 miles on electric power, and takes five hours to charge on 120V. For 2017 forward-collision warning with automatic braking is standard, but with all those other features these things doesn’t matter a lot. The first competitor of the Prius, The Ioniq. 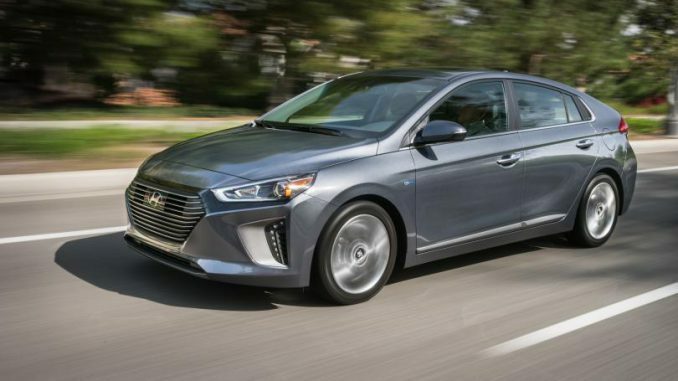 As we all know, the Prius silhouette and hatchback configuration, the Ioniq hybrid isnt much of a difference and matches it as a fuel sipper with 52 mpg overall. A 1.6 liter 4 cylinder engine is responsible for providing it power which, combined with the electric drive, puts out a combined 139 hp. The six-speed dual-clutch transmission isn’t the smoothest and there’s some delay off the line. Like other hybrids it can drive on electric power at low speeds. Handling lacks agility and the ride is a bit unsettled but unobjectionable. The SEL comes with a power seat for an affordable price. Some advanced safety features include, automatic braking, smart cruise control, and blind-spot detection with rear cross-traffic alert. Android Auto and Apple Car Play compatibility is standard. There are also plug-in and fully electric versions. Kia’s five-passenger Niro marries good fuel economy with cargo versatility. Yet another 1.6 liter 4 cylinder engines is in charge for power for this hybrid as well. This then, in conjunction with the electric drive unit, puts out a combined 139 hp. This combo is mated to a six-speed dual-clutch transmission. The lithium-ion battery is located under the rear seat, and that creates a flat cargo floor when the rear seats are folded. We got 43 mpg overall, which is good but not as good as the Hyundai Ioniq or Toyota Prius. The handling lacks agility and the ride are a bit choppy. The optional power driver seat provides better support than the standard seats do. A suite of advanced safety features is available, including automatic emergency braking, smart cruise control, and blind-spot detection with rear cross-traffic alert, but that tends to push the price to above $30,000. Not bad is it? The design’s pretty cool too! High on style and low on fuel with an average mileage of over 20km per liter, no wonder why the German’s call their car, (starting at Dh79, 732) remains one of the world’s best selling models. Only the Mitsubishi Mirage 1.2 GLX (starting Dh37, 900) comes close to matching its fuel efficiency and notably for less than half the price.